Constitution amendment by popular demand? The real problem with Okoa Kenya’s proposal for constitutional amendment was not the signature issue. Nor was it the ideas for changing the Constitution, some of which are reasonable, some less so. The real problem is that the Okoa Kenya Movement (OKM) procedure was simply not what was envisaged by the drafters of the Constitution. The idea was that if at least one million voters felt very strongly that some change should be made in the Constitution it would be right to compel the assemblies of all 47 counties to consider it. But it goes further: if at least 24 counties approved of it by simple majorities, Parliament would be required to discuss it, and – if each house of Parliament did not approve (only a simple majority of members is required) –the country would have to go through the expense of a referendum. Surely the first stage in such a process would be vital, and the key issue is whether the one million voters plus really knew what they were signing? Any other ancillary amendment [i.e. anything necessary because of these five]. Did the people who signed really have any clear idea what they were signing? Using the content of the draft Bill produced by the OKOA committee of experts in November last year, we ask: Did those who signed imagine they were approving the strengthening of rights to a national ID card? Or a new “national value” in Article 10 (separation of powers)? Did they know they were supporting extending the time the Supreme Court has to decide presidential election petitions? Did they know they were supporting the requirement for every county to have a Ward Development Fund? Did they know they were supporting giving the Senate more functions in approving various public appointments? Or giving it a role in passing all legislation, not just legislation affecting counties? Did they know they were proposing that only up to one third of Cabinet Secretaries could be appointed from outside Parliament (now all must be from outside)? If you study the five main suggestions, can you identify which suggestion each of these changes relates to? Arguably the ID card is a prerequisite for achieving suggestion 4. Some proposals changes in the Bill can be related more easily to specific suggestions among the five that people signed. The best known is to increase the minimum percentage of the annual national revenue that must be allocated to the counties from 15% to 45%. But how could those who signed have known that “Increase revenue allocation to county governments” meant raising 15% to 45%? We understand that at least some of the books of signatures included a statement that the draft bill had been explained to those signing. But how do we know what was explained to them? It would take quite some time to explain the Bill. Was this done for every individual or small group of people interested in signing? Or were many prepared to sign anything that they thought had Raila’s support? The Bill we have now was made public only in November 2015, when the signatures were also ready to go to the IEBC. But there had been a previous Bill, in April 2015, that included various ideas that did not survive into the November Bill. These included a 75 years retirement age for judges, provision for the Constituency Development Fund (CDF), constitutionalising the EACC, and removing even a formal role for the President in the appointment of the Chief Justice. But the April Bill did not include (for example) the new “national value”, giving the Senate more powers, or the provision about Cabinet Secretaries coming from Parliament. So, even if a Bill was explained to those who signed, which Bill? The only reliable indication of what people were supporting is what was on the paper that they signed – namely the six suggestions. Why are we so bothered about this? After all, the OKM initiative has failed. 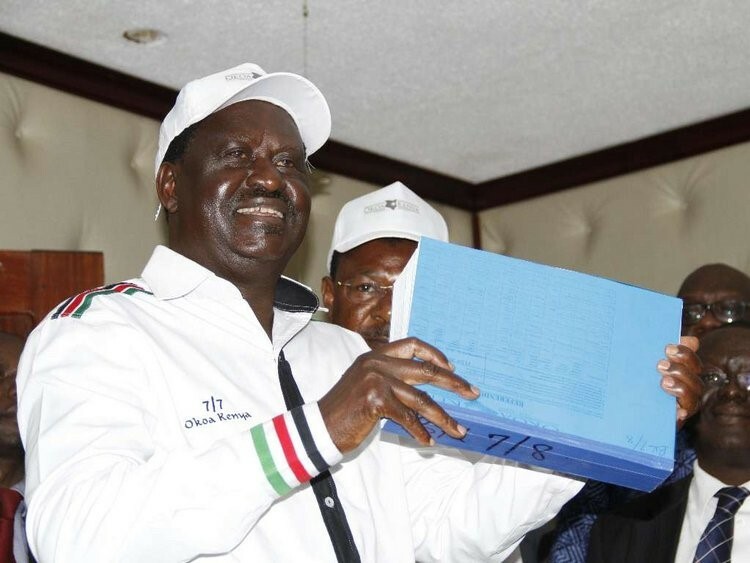 But the IEBC has suggested a fresh effort might be made to get signatures. And there are various other initiatives on the horizon: other groups proposing the same route to constitutional change. So it seems worth analysing this, the first attempt, to learn how not to do it. How should it be done? After all, for the people to be able to set in train an amendment to the Constitution that they really want sounds like a good idea. We believe that the OKM initiative departed in important ways from what the constitution drafters had in mind. The Constitution provides that the proposal may be a fully drafted Bill to amend the Constitution, or a “general suggestion”. We believe that a “general suggestion” means something clear but not expressed in legal language. Not something as vague as the OKM six suggestions. If that paper has just a “general suggestion” it must be so clear that there can be little uncertainty about what the final Bill will say. The Kenya Constitution provision is based on the Swiss Constitution. If the “general suggestions” approach is used, the Bill spelling out the general suggestion would be prepared by the Federal Parliament, not the proposers. Parliament obviously must be able to understand readily what was intended. No-one could have known what the OKM suggestions meant. Indeed OKM itself evidently had doubts and divisions. In Switzerland the law requires that the proposal be focused and deal with only one topic. In February this year a proposal to introduce into the Constitution a definition of marriage as being between a man and a woman was (narrowly) defeated. OKM has proposed a large number of changes, with little relationship between them. Is this what the Kenyan Constitution means when it speaks of “an amendment”? What happened in the OKM process took the initiative away from the people into the hands of the committee of experts, which seems a travesty of the constitutional idea. Where has the debate been about these important ideas? Where would the debate have been if the counties had received the Bill and had to vote on it in three months? If a majority of counties had approved it but Parliament rejected it, how informed a debate would have taken place before the referendum? The suggestions that counties should get at least 45% of revenue alone would require extremely careful and detailed consideration. The national government is responsible for the police and military, the courts, education, major roads– all very heavy budget items. There was no suggestion to transfer any of these to counties. The November OKM Bill includes that registration must be done at every polling station. Most polling stations are schools. But the Constitution says there must be continuous registration – at schools? And the Bill says the IEBC must ensure that “all eligible voters actually exercise their right under Article 38 to vote”. Does this mean compulsory voting? Finally, how could the referendum have usefully decided what the people actually thought about so many ideas (around 20)? We have been spared a chaotic situation. Let us hope that anyone else with popular initiative schemes will be more modest in their ambitions, and think things through better. The authors are directors of the Katiba Institute.